Because you demanded it: BACON. Behold Nerdy Meal Time and weep. It is as if millions of pigs cried out in terror and were suddenly silenced. We’re joined by THE PROTOMEN as we voyage deep into a meaty, greasy abyss. These robits from the future sure know how to chow down. Q: What would the bacon craze be without Epic Meal Time? A: A withered and well-humped husk. But these Princes of Meat have become Internet Kings with their legendary videos. They are an inspiration. So, paying homage to their legacy, we have combined their greatness with our own nerd brilliance. F–king SMART. This is Nerdy Show isn’t it? So you know we’re going to record a damn podcast. That’s the name of the game. Nerdy Meal Time is the main event, but in this bacon podcast we get into the nitty gritty. Want to find out how bacon is made? We drove from Orlando, Florida to Nashville, Tennessee to find out. Adventure with us to The Loveless Cafe where they smoke their own meats and make some of the finest bacon products in the U.S. of A. We speak with Tony the Pitmaster and Loveless (bacon) spokesperson Jesse Goldstein about how cute pigs are transformed into succulent pork products of every shape and form. Joining Cap, Hex, Brandon, Colin, and Luke for this episode is Chrystal Casale, pro chef and instrumental force behind making Nerdy Meal Time a reality. We drop some science on this whole bacon phenomena and recount the dramatic tale of how Nerdy Meal Time came into being… and its painful side-effects. Big thanks to: Twothums, Jobarda, MuckRaker, Stuart Edney, BigBadShadowMan, Frozentreasure, and all our other supporters of October ’11 who made this bacon-stravaganza possible. 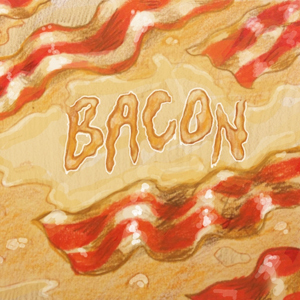 Get Kristin’s bacon art on a shirt or something!